When Rebecca Charles of New York’s celebrated Pearl Oyster Bar first taught me the recipe for her scallop chowder, I asked if it was possible to substitute milk for the cream. She looked at me like I was crazy. “Why would you want to do that?” she asked. Good question. This recipe (featured in SECRETS OF THE BEST CHEFS, a great holiday gift!) is one of the simplest, most comforting winter foods you can possibly make. Turns out, it’s all about the cream which has the remarkable ability to take on whatever flavors you heat it up with. In dessert, that flavored mixture becomes ice cream; here it becomes chowder. Now just because something is simple doesn’t mean that you can be careless. In fact, with simple recipes, you have to be that much more careful. Take, for example, the onions. It would be easy to brown them by cooking them too long or keeping the heat too high. For the balance of flavors in a chowder, you just want to sweat them–to draw out their flavor slowly, infusing the butter, without coloring them. That takes a good 10 minutes or so. Then, the potatoes, which once again you sweat along with the onions and a pinch of salt. This all happens very gradually. Pour a glug straight from the bottle (along with some thyme leaves) stir all around and taste. The Pernod imparts a very subtle, barely detectible licorice flavor that elevates everything even more. Heaven right? Every time I make this for a crowd (and I’ve done it twice, once for paying customers!) everyone’s licking their bowls by the end. It’s your reward for dealing with cold weather. You deserve it. 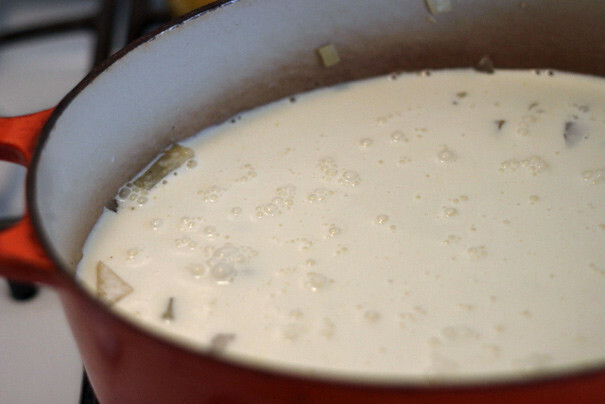 Begin by melting the butter in a large pot over medium heat. 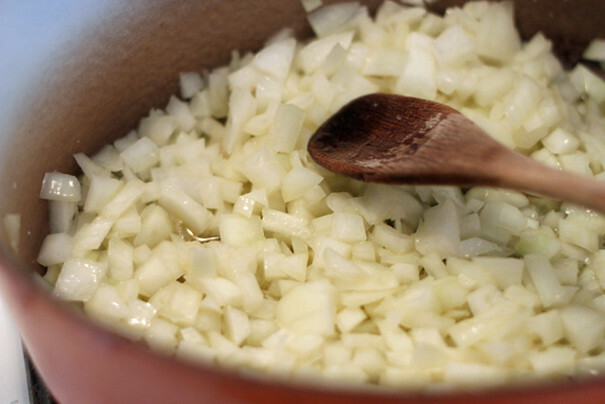 Add the onions, season with salt and pepper, and cook, lowering the heat a little, until the onions soften. Take your time here (about 10 minutes or so); this is where the onions develop flavor. Just don’t let them brown. 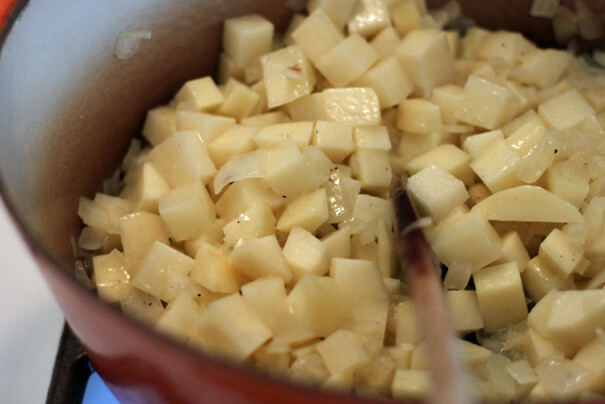 Add the potatoes to the onions, season, and cook, again, slowly, for 5 more minutes. Add the scallops, season again, stir, and add enough cream until everything is covered. Bring to a simmer and cook, slowly, until the liquid reduces substantially, approximately 45 minutes. 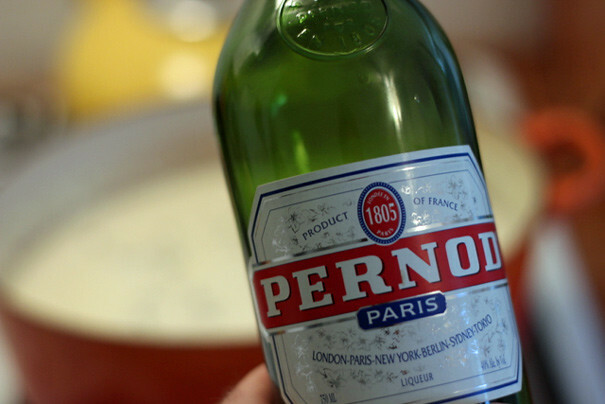 Add the Pernod–which gives everything a lovely anise flavor–and the thyme and cook a few minutes longer. 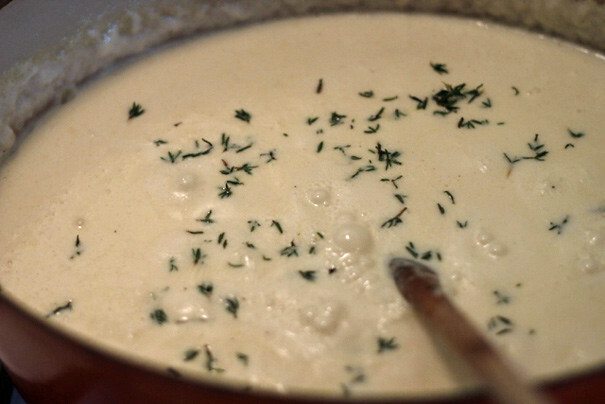 Remove from the heat and either serve right away, with chives sprinkled on top, or allow the chowder to come to room temperature and refrigerate overnight. 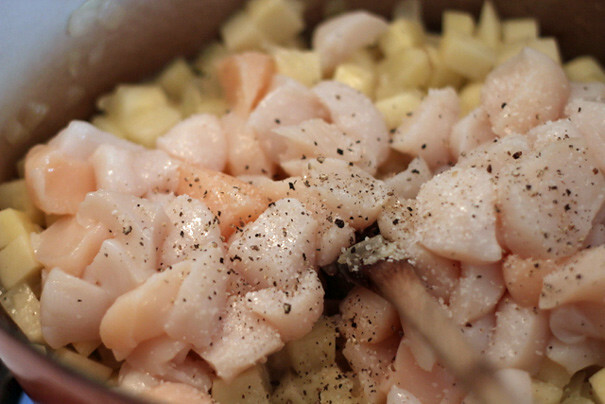 The flavors will develop if you allow for this extra step, but once you taste the chowder, you won’t be able to wait. Keeps for 3 to 4 days, covered, in the refrigerator.